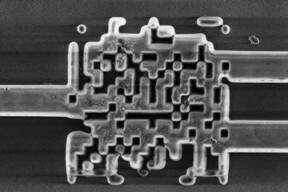 The overhead view of a new beamsplitter for silicon photonics chips that is the size of one-fiftieth the width of a human hair. University of Utah engineers have taken a step forward in creating the next generation of computers and mobile devices capable of speeds millions of times faster than current machines. The Utah engineers have developed an ultracompact beamsplitter -- the smallest on record -- for dividing light waves into two separate channels of information. The device brings researchers closer to producing silicon photonic chips that compute and shuttle data with light instead of electrons. Electrical and computer engineering associate professor Rajesh Menon and colleagues describe their invention today in the journal Nature Photonics. Co-authors on the paper include research associate Randy Polson and doctoral students Bing Shen and Peng Wang. 72 S. Central Campus Dr.